My friend John DeWalt and I were really off the beaten path. The pavement ended several miles ago and still, there was no cemetery. John was pretty sure it was the right road. On both sides, the woods were thick with tall trees that came right to the edge of the road. The underbrush looked impenetrable. It seemed as if we hadn’t seen a house or even another car for miles. The dirt road was narrow and straight. The small hills made it impossible to see very far ahead, giving it a sense of surreal timelessness. This trip was a spur of the moment thing. Both of us were getting over a bad cold. Mine had turned into pneumonia. The antibiotic had kicked in and we were tired of being cooped up. The upside of being sick was John and I had a more relaxing time for ourselves. There were visits we wanted to make while I was visiting him in Mansfield, Ohio, for a couple of weeks. Getting together with friends was put on hold because we didn’t want to infect them. So, here we were driving through this remote and picturesque area. Sometimes Fate just steps in and if you’re willing to go with the flow, it can take you to unexpected places and adventures. Searching for a ghost certainly qualifies as adventurous. John and I had started out just enjoying the countryside. It was pretty aimless–at least until he remembered stories about a local cemetery at the end of the road that is supposedly haunted by the spirit of Mary Jane Hendrickson. It sounded intriguing so off we went in search of a graveyard with a ghost. The drive was beautiful. May flowers were in full bloom, especially the lilacs, which are my favorites. We passed up several bushes with huge flowers, bigger than I can grow in California. Although my allergies prevented me from taking any of them with us, I couldn’t resist the pink, lavender and even white blooms. Finally, I talked John into pulling over in front of a house with a thicket of lilac bushes loaded with the light purple blossoms. The owners, working in the front yard, were friendly. They were happy to let me stand in the middle of their lilac bush and just soak up the scent. We talked about California and Ohio for a few minutes and as John and I started to leave, they told us of a short cut to the cemetery road. A little while later, we were back on the trail of Mary Jane Hendrickson. All I knew at this time was the local lore about her. According to the stories, she had been burned as a witch and legends tell of really bad things happening to anyone spitting on her grave. Her ghost had haunted Mount Olive Cemetery for decades. Just as we could finally see the end of the road ahead, a space in the woods opened up on our left. There was a dilapidated wire fence but the gravestones could be seen from the car. We found a small entrance and walked around reading the headstones. Most of them dated back over 125 years. Standing in the middle of the old cemetery, with its remoteness, its narrow dirt road and the quiet hush that comes with being alone, the centuries began to blur. On the other side of the car were beer cans and liquor bottles but here in the graveyard, there were no signs of modern civilization. It wasn’t a very big cemetery and it didn’t take us long to check the stones but the only one engraved with her name was the big stone at the entrance that listed everyone buried there. No, we didn’t see or hear any ghosts. In fact, there was a sense of peace and serenity rarely found today. When John and I left later that afternoon, I brought out my computer and did some online research about Mary Jane and the cemetery at the end of the road. There are several websites dedicated to ghosts and supernatural phenomenon that feature Mary Jane’s story. Some of them quite lurid. The NWA Ghost Connection gives details of their personal experience. As soon as we entered the cemetery, the darkness overwhelmed us. Our flashlights barely penetrated the darkness ten feet in front of us. We immediately made our way to the famous tree where many of the rumored hauntings seem to originate from. We sat under the tree, surveying our surroundings for a few minutes and taking readings…At the end of the investigation, the team was chased from the graveyard by who we think was Mary Jane. All in all, no one was sad to be leaving. Without a doubt, we classify this cemetery as red on our Haunting Scale. We do not recommend anyone go there, as the spirits there do not have good intentions. We are hesitant to even say that we would do a revisit, given the opportunity. According to legend, anyone who jumps over Mary Jane’s grave and spits on the stone will be dead or badly injured within three days. The article also described her as a witch and a Shawnee herbalist and stated she died March 3, 1898, at the age of 25. Other stories about her have been reported in the Mansfield News Journal over the years and the paper noted that the cemetery is featured in the book, Haunted Ohio. 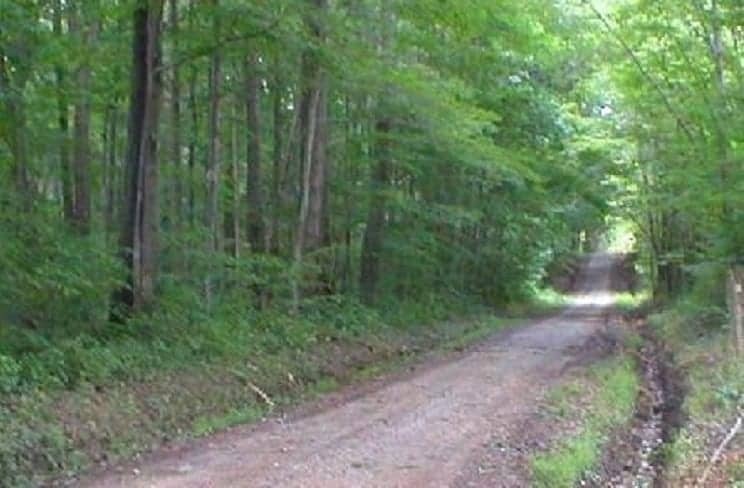 The rowdy high schoolers were often drunk and stoned when they left the graveyard at midnight, and the shadowy rumors about the place grew darker and scarier when a car full of teens wrecked tragically on Possum Run Road. Once the funeral was over, it was rumored that the victim had pissed on Mary Jane’s Grave just minutes before his death. People have reported seeing a woman in white as well as the apparition of a bearded man at the cemetery. Some locals claim that their car doors will lock by themselves or that their car will die for no reason. Batteries also get drained quickly at the cemetery. Mansfield locals have reported having things thrown at them through the trees at Lucas Cemetery [aka Mount Olive Cemetery] as well as disembodied screams. This graveyard is said to be haunted by the ghost of Mary Jane, also known as Bloody Mary…this Bloody Mary character was a witch who was purportedly burnt at the stake. This story behind the Lucas Cemetery haunting takes place in the 1800s. After Bloody Mary was buried, a tree near her grave with her name etched into it would “bleed”. There is no tombstone marking her gravesite, just the tree. However, further research that evening revealed the stories about her were just that: stories. If the legends about her ghost and hauntings were not true, who was the real Mary Jane Hendrickson? Mary Jane Hendrickson was born on 22 Sep 1825 in Holmes County, Ohio and died at age 72 on 3 Mar 1898 [sic]. She is buried in Mount Olive Cemetery. Mary Jane lived in Hastings and died of a cancerous tumor and dropsy [an archaic term for edema], according to her obituary printed in the 03-10-1898 edition of the Bellville Messenger. She was not hanged, as stories tell. The obituary states that she lived with her sister and brother-in-law, Sophia & Samuel Secrist for more than 16 years. She is buried next to them. She was the daughter of William A. & Mary Ann (Drake) Hendrickson, who are both buried in the Bellville Cemetery located in Belleville, OH. Mary Jane was an 11-year member of the Evangelical Association. This obituary is a far cry from the story of a witch being hung by her neighbors at age 26. Because she was most certainly not burned as a witch, nor did she take to her grave a life story any more malevolent than that which the trials of life bring to any other hapless soul in the graveyard. [sic] There isn’t a great deal known about her because there was hardly anything in her life to distinguish her from any other of the farm women of the Monroe Township countryside around Hastings. She was somebody’s sweet old aunt who died of cancer in 1898….. The only reason the tremendously dark aura coalesced about her name is because in the summer of 1960 a camp counselor at Hidden Hollow Camp nearby looked around the graveyard for a stone upon which to hang a story and chose the humble headstone under a big old spruce marked Mary Jane as a suitable landmark for a witch story, to give young campers the creeps. The fictional campfire tale recounted at Hidden Hollow told of Mary Jane abusing her evil powers until the neighbors finally rose up against her and hung her in the cemetery from a mighty pine. The tale concluded with a cautionary curse intended to protect the tree and her grave from mischievous trespassers. It all began so simply, as harmless fun for a Halloween-in-July theme day activity, when kids took a spooky hike through the nighttime forest to a haunted graveyard. It was so popular the spook hike became a yearly, and then a weekly event at camp for thousands of youngsters through the ensuing decades. Who could have imagined in 1960 what the seed of that party-game would sprout into by the 70s, and what a bizarre, thorny poisonous vine would emerge through the 2000s to choke the life out of a once-lovely peaceful country boneyard? As Tim McKee’s article points out, as a result of the stories told about Mary Jane, her grave and most of the fifty or more graves in that cemetery from the late 19th century, were defaced by vandals. So much so that her exact location cannot be determined. Even the tree is no longer there. When John and I visited Mount Olive Cemetery in May 2016, instead of the tall and lush spruce, there was only a two-foot-high stump. Over a year earlier, the Mansfield News Journal reported that in October 2014, the spruce where legends say Mary Jane was hung and which was the supposed to be the site of her grave, was vandalized. A 17-year old took a chain saw and cut down the tree that was estimated to be between 120 and 145 years old. It fell on several headstones, breaking them and knocking others off their bases, adding more wounds to the already scarred graveyard. If Mary Jane Hendrickson is haunting the Mount Olive graveyard, perhaps she just wants to clear her name so she and the others who are buried in the Cemetery at the End of the Road can rest in peace.